While 49 days have passed from the deadly attack on Camp Ashraf, the humanitarian crisis of 3000 residents in camp Liberty Iraq continues. Hundreds of residents are on hunger strike, and their health has terribly deteriorated. On September 1st, Iraqi forces, doing the Iranian regime’s bidding, savagely murdered 52 residents of Ashraf and abducted 7 others, including 6 women. Reliable documents and accounts given by eyewitnesses at the scene indicate that the attack was conducted by Iraqi forces under the command of the Prime Ministry’s office. Documents obtained from inside Iran clearly prove that the 7 hostages are in Iraq, in prisons controlled by the Iraqi Prime Minister Nouri al-Maliki. Maliki is constantly denying the facts and has deceived the international community, particularly the United States and United Nations, who are responsible for the protection of the residents of the camp and especially the 7 hostages. On October 10, 2013, the European Parliament passed a resolution about “Recent Violence in Iraq”, in which it strongly condemned the 1st September attack on Ashraf. According to Ms. Catherine Ashton, the High Representative of the European Union, there is reason to believe that the seven hostages are being kept in Baghdad and the (parliament) calls for their immediate and unconditional release. The outrageous crime committed in Ashraf on September 1st was not a terrorist act by a militia group, but a crime committed by a government strongly tied to the regime of Tehran, carrying out the suppressive policies of the Iranian regime against members of its opposition. Maliki’s government and the Iranian regime have tried to physically eliminate the opposition members in Iraq through a food and medical blockade, three murderous raids on camp Ashraf, and two rocket attacks on camp Liberty, so far resulting in more than 130 deaths and 1200 wounded residents. Despite all assurances and guarantees so far given by the United States officials and the United Nations regarding the protection of the residents, none have been fulfilled to date. Even the minimum means of protection that were promised by Deputy Secretary of State Beth Jones to the Mojahedin leadership were not implemented by the Iraqi government. This has left the residents of camp Liberty with a single choice: Since September 1st, they’ve gone on hunger strike, demanding the immediate release of the seven hostages and the provision of camp Liberty’s security by UN Blue Helmets. In a US Senate hearing, Senator Menendez told Assistant Secretary of State Ms. Wendy Sherman, that if the security of Camp Liberty residents isn’t provided and the hostages are not released, the Senate will be reconsidering its aid to the Iraqi government. The voices of the Senators and members of the House of Representatives and the European Parliament reflect the awakened human consciences, not tolerating such crimes and abhorred by the silence of the United States and United Nations, which will only give the green light for more massacres by Maliki. The residents of Liberty on hunger strike are also asking President Obama to stay true to his word, and fulfill the promise of protection that he has given to every one of them. The residents believe that their current situation is the result of trusting the United States. 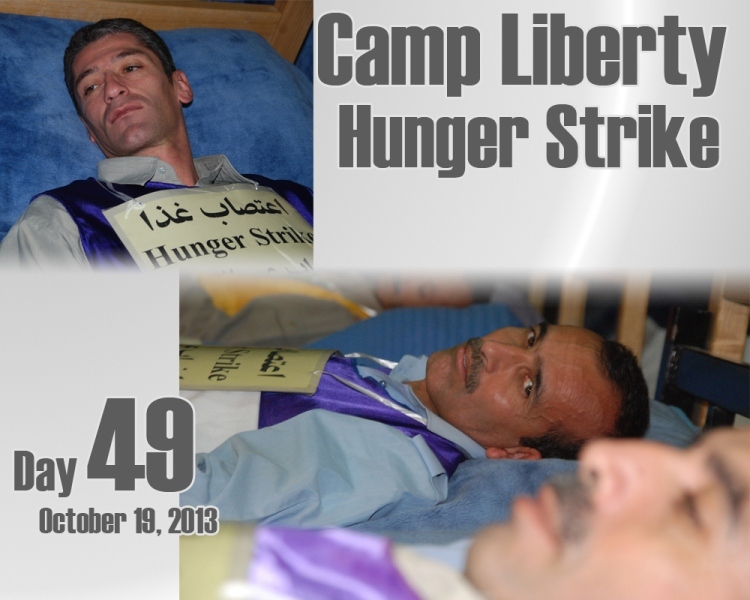 The hunger strikers have made it clear that they will continue their hunger strike until their demands are met. Next Next post: Have you heard of hostage-taking of my innocent mother in Iraq?